Brace yourself Liverpool fans. It's Burnley again and Jurgen Klopp has no Plan B. The Liverpool boss is happy to tell the world that he has no "special plan" to deal with the team that brought his wonderful opening to the season to an abrupt halt back in August. After beating Arsenal 4-3 in a cracker at the Emirates, die-hard Reds felt the hand of destiny on their shoulders and looked forward to the season ahead with high expectation. Just a few days later, they trooped home from Turf Moor with a chastening defeat. "We don't play checkers," said Klopp. "We've spoken about the things we have to do but not in the case of a team against the lower part of the table. "I know what people say and it is not the first time people have said something like this but I don't have a Plan B in my mind. "We know how to play but in the end you have to come into specific spaces and make the right decisions. "My job is to help them make the right decisions more easily. That is what training is for. It is a challenge. The news that their manager has no intention of adjusting his approach to meet an obvious physical threat will not fill the Kop with confidence. The Reds' five league defeats have all come against bottom-half sides, starting at Turf Moor in August when they had 80pc possession and 26 shots but lost after the Clarets scored with their only two efforts on target. Since then they have been beaten by Bournemouth, Swansea, Hull and Leicester and while none have quite followed the pattern set by Sean Dyche's tactics there is no doubt teams who sit back and hit on the counter-attack have been more successful against Liverpool. Klopp is well aware of the criticism of his side in these moments and the struggles they have had, but stressed that was no reason to completely alter the strategy. "We knew it after the Arsenal game (a 3-1 win last weekend) these questions would be asked. We have to prove it on the pitch. "Before the Arsenal game the mood here was quite optimistic but I think a lot of people thought 'if we lose then we have real problems'. "In this moment I am not sure we will win against Burnley but I am quite optimistic because I know about the boys." Since the start of the season, some seasoned pundits, notably The Herald's John Giles, have pointed out that Klopp's front-foot mentality can only work with better players and must have some kind of defensive platform to fall back on. But Klopp is unapologetic about his philosophy and despite glaring holes in his defence during an epic form slump over last two months he will plough on in the face of more workmanlike teams with a less expansive mindset. The more he doggedly stays the same, the more he resembles Brendan Rodgers. "If Plan A doesn't work, Plan B is to make a change to make Plan A more effective," was the Northern Irishman's response to similar criticism. 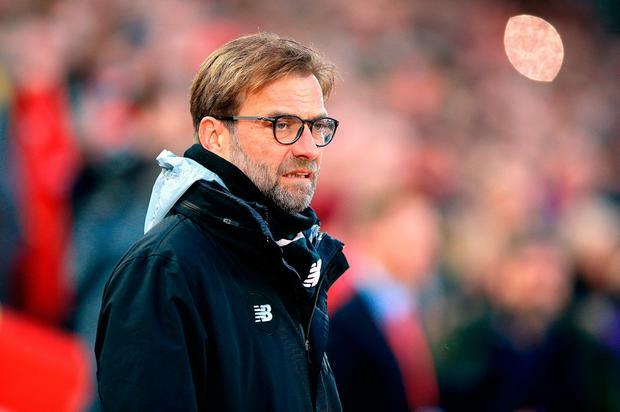 Klopp admitted that defeat at Turf Moor on the second weekend of the season remains a source of frustration for him. He does, however, acknowledge and admire the work Dyche has done despite Burnley failing to win an away match in the league this season. "Even if we had won all the games against other teams (in the bottom half) Burnley is special because they have the clearest plan of all these teams," added the German. "Against Burnley it is clear what you have to expect. They defend like they defend, long balls, counter-attacks, but it is really tuned: (Ashley) Barnes, (Sam) Vokes, (Andre) Gray are running on to channel balls in behind, set-pieces, so you know it can't be easy. "We need to be ready for work again, creating an atmosphere on the pitch and in the stadium. Klopp clearly feels that his players are feeling the pressure from the expectations of the fans at Anfield. "You miss a chance against Arsenal and no one is surprised. You miss a chance against Burnley and everyone thinks differently - 'Ah, difficult, difficult, we won't have another chance like this'. "We need to feel free for playing football," he said. "We know about a few problems already but we've had good sessions and we have to go and win the game."